Professional Chefs Diploma students from Nottingham College battled it out in the kitchen today (3rd May), prepping, cooking and serving a three-course menu, which they designed themselves, in the hope of winning the chance to cook alongside Dan Burridge, Head Chef at Hart’s Hotel and Restaurant. 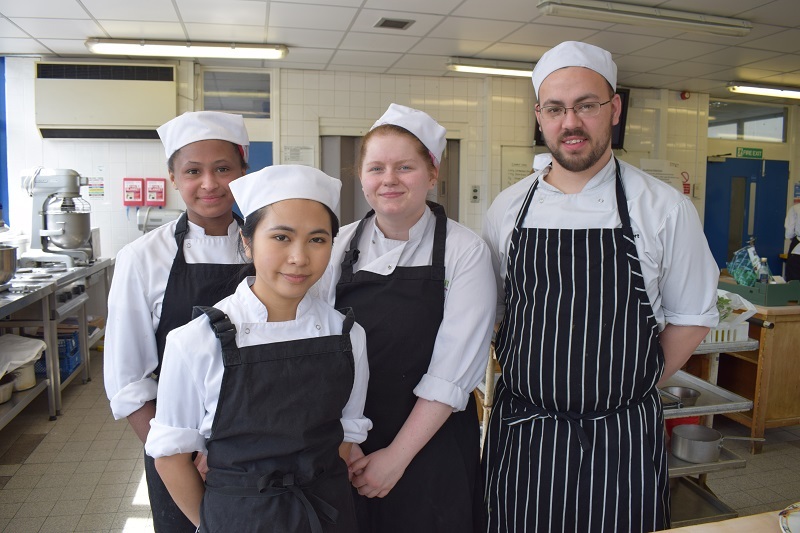 The group of Level 2 students were given the brief back in November last year and have taken part in a series of competitive challenges designed to demonstrate their culinary skills. They were tasked with researching Hart’s, and designing a starter, main and dessert to reflect the Restaurant’s style and ethos. They were responsible for researching costings, ingredients and seasonality, and had to demonstrate their knowledge of taste, texture and flavour, as well as showcase originality, presentation, and technical ability. The original group of 27 students were whittled down to just two teams, who today went head to head at the College’s Clarendon campus, in front of industry judges Dan Burridge and Emma Neal IQA/Chef Assessor for Professional Assessment Limited (PAL). Dan Burridge, Hart’s Head Chef, said: “It’s massively important for the next generation of chefs to gain industry experience like this and I feel honoured to be part of it. “I’ve really enjoyed interacting with the students; they are all clearly very passionate about food and have shown great enthusiasm and professionalism throughout the process. I’m really impressed with their level of cooking. “Today was all about technical cooking, using good quality, seasonal ingredients, and the teams didn’t disappoint; the dishes put in front of myself and Emma looked and tasted incredible. They should all be very proud of themselves. “Picking the winning team was the hardest part, but in the end it came down to which group worked best as a team. This is such an important part of working in a successful kitchen; without a good team at Hart’s, we wouldn’t be able to produce the standard of food we do.